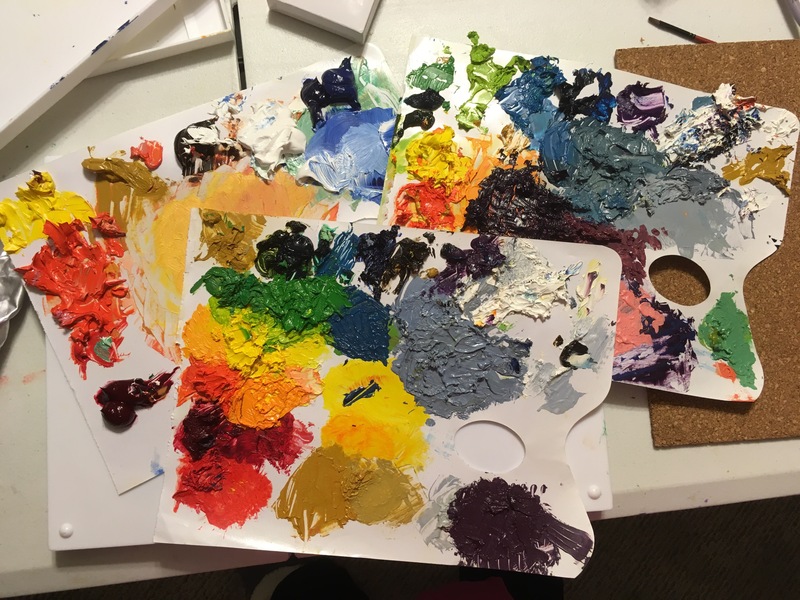 In this edition of Tuesday Tools of the Trade, paint palettes get to be the star player. I wouldn’t be able to paint in much the manner that I paint without paint palettes. While there are many, many different types of palettes, today’s featured tool is the disposable paint palette. Occasionally I like to work with the disposable paint palette because it makes for easier cleanup if I’m feeling lazy, or it enables me to paint plein air a bit easier if I’m packing my gear to paint outside. The thing that I like about using paint palettes is that often if I start a paint project and then finish it but forget to clean the paint off, the paint hardens as a form of documentary evidence of what colors I worked with, how I mixed them and what colors I used the most. Often when I find a palette laying around and dried, I can oft recall which painting I used it on just from the colors. The disposable palette consists of a pad of wax-lined paper in the shape of a palette, some even include the thumb hole (my preference). When selecting a new palette, merely rip off the top sheet covered in paint, and start afresh, no solvents, scrubbing or sink needed! This entry was posted in Studio Views, tools of the trade and tagged disposable paint palettes, paint palettes, tools of the trade. Bookmark the permalink.